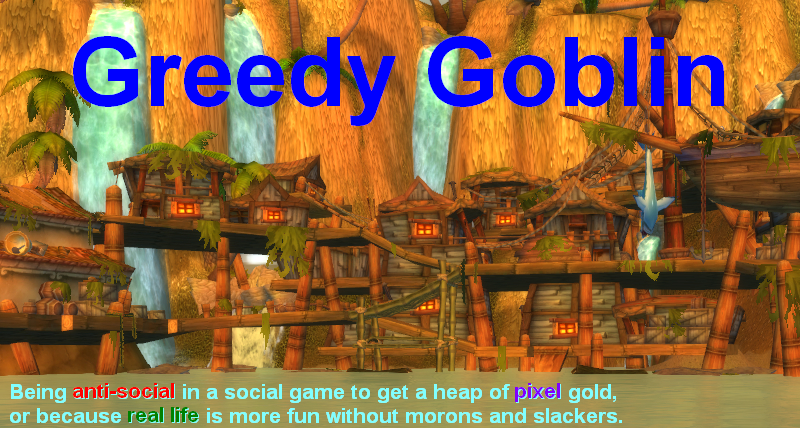 Greedy goblin: Look who is ratting here! Look who is ratting here! Dotlan saves and serves all NPC, ship kill and sov change data, for every region, every day. For example here is the Fountain ratting data for 2013/01/01. You can manually download this page. For extracting the data from the mess it returns, I wrote a little program. Hanura H'arasch mass-downloaded for me all the data for June and July this year, all regions. You can use it too. Surprises after surprises. The first is how much Providence dwellers rat, despite their bad truesec. By the way the common belief of "better sec, more ratting" isn't really true. There is such correlation, but weak as the standard distribution is twice as big as the average (944, 1891), despite every point is the 2-months average rat count: Secondly, NPC-null is unused. 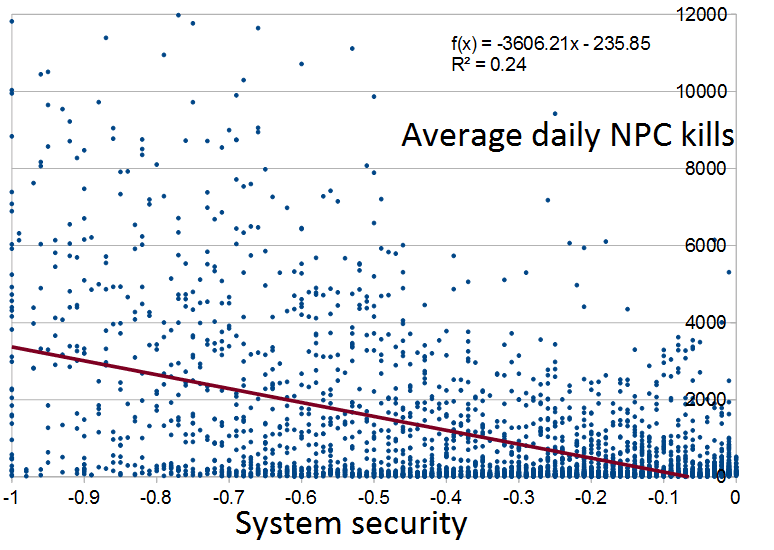 Their rat kill per system per day is deep red, meaning way below the total nullsec average. The only exceptions are Serpentis and Mordus' Legion, but they have only a handful of systems. Maybe some space could be changed into conquerable. Thukker Tribe and ORE spaces are especially unused, first for having agents in highsec, second for having no rewards at all (ORE faction mining equipment is worse than T2). Thirdly, HERO coalition members - despite being in huge numbers in relatively small space - barely use their systems. BRAVE and HONOR systems are deep in the red. This alone questions their war against Providence. Why take space if you already don't use yours? Maybe the action fitting the true needs of the members would be moving to NPC space. Of course the elephant in the room is Goonswarm Federation ratting twice as much as their own renters. Their home region, Deklein sees nearly twice as much ratting as the second highest Branch - home of their worst PvP-er minion, FCON, who are the #5 ratters with deep green system usage. Killing more than 10% of the total null rats, the GSF corps pull several hundred billion ISK ratting tax every month. They are barely outperformed by all the renters of Pandemic Legion. 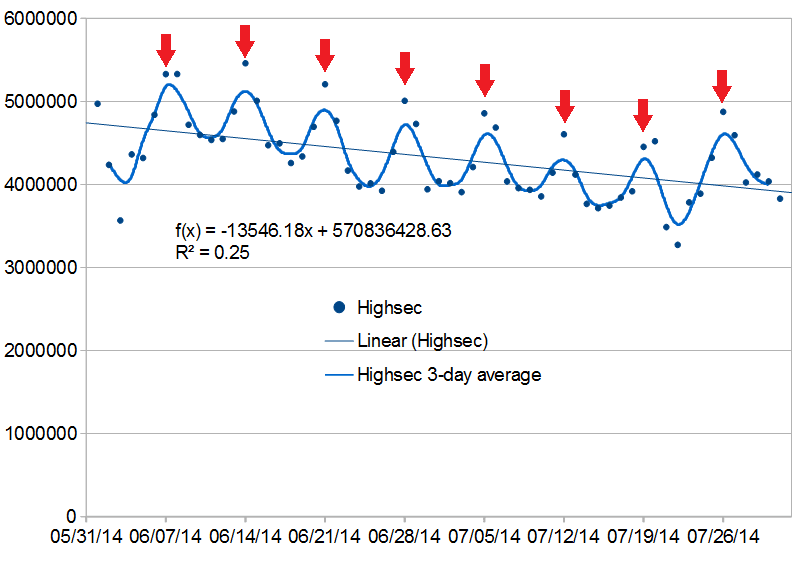 Below you can see the daily ratting results of total highsec and lowsec. At first, it's hard to not see that less and less people play EVE. Secondly, there is a clear weekly pattern, significantly more people play on the weekends than on the workdays, Saturdays being the peak (red arrows). Is nullsec similar? Well, the decrease is missing. It seems that the nullsec players are more stable, EVE is losing highsec and lowsec casuals. The weekly pattern is present here too. 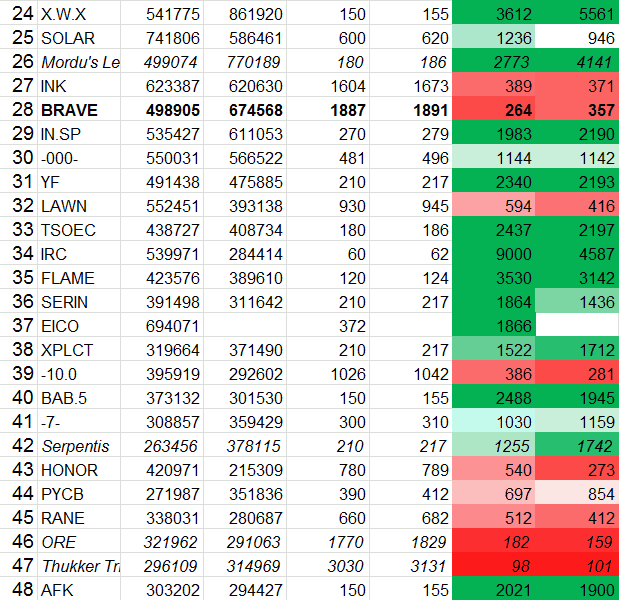 The title of the chart is "rest of nullsec", because the top 4 ratters are missing. 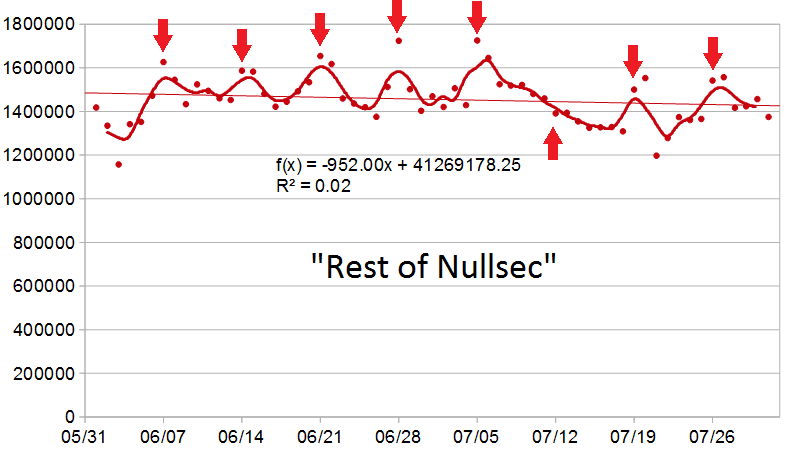 By the way, this "rest of null" is shrinking. 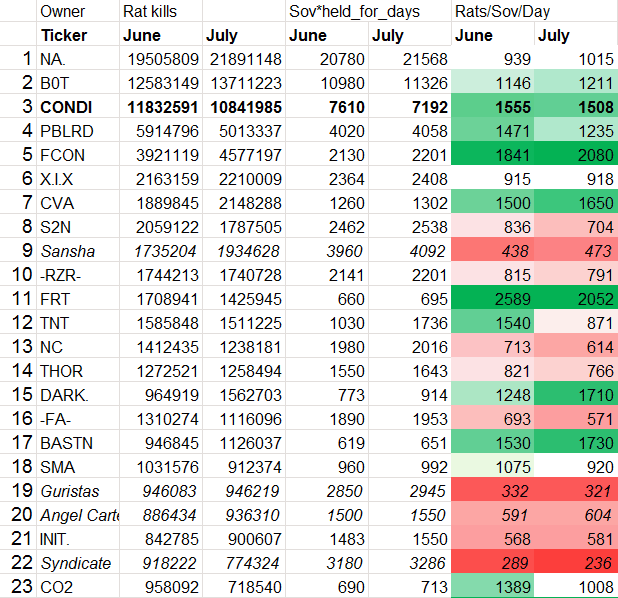 They killed 47% of the rats in June and 40% in July, despite the top four didn't claim more Sov in the summer. B0T clearly has the weekly pattern, the rest can't really be seen from the large changes (Deployments? Team Security is in action?). So I made a calculation where every day was compared to the average of the 3 days before and after it, then calculated the difference of Monday-Thursday and Saturday-Sunday. 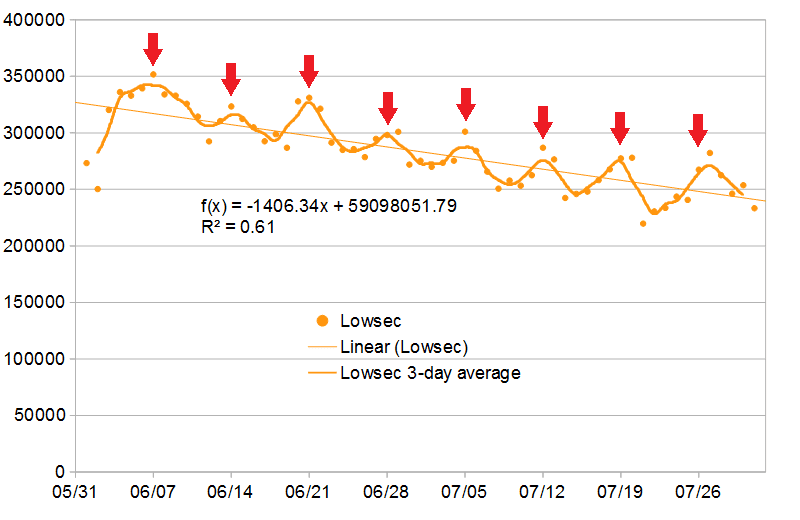 The bigger it is, the bigger the oscillation is: In lowsec, rest of null, Goon space and in B0T space people rat less on workdays, which means they have a job or school. In PBLRD and especially N3 space, nolife play or botting is dominant. It seems the Goons are telling the truth that the little Goon with his ratting ship is out in Deklein and not the botters. Well, better for us, since hunting bots is harder as they warp out instantly when a neutral enters local. PS: these carriers won't increase the Deklein ratting count. Of course the elephant in the room is Goonswarm Federation ratting twice as much as their own renters. If everyone is ratting in Deklein, why Branch is #2? Look at the list, it's full of CFC members in their own space! Yes, most of us rat in our own space. I for instance rat in Delve. Because, regardless of how many graphs you make, the 'wars' and 'destructive small gang roams to kill CFC' are in no way disruptive enough to even bother flying a clone to deklein. Delve has been under attack by various enteties the last two months or so, and I don't know anyone there who hasn't made far more money than they lost. I also don't quite see why you are suprised by the amount of ratting done. It is the only effective way to actually *create* ISK. Station trading and stuff might earn an individual more, but that's just moving already existing ISK around. If ratting stops the EVE economy collapses. I don't see Delve on the top 25 null region list! BRAVE ratting systems are almost always camped by hotdropers. It's too dangerous to rat here. So I just do my PVE in hisec. Maybe HERO cannot rat, due to everyone thinks they are easy preys. But that doesn't change the fact that they can't really use more Sov. The CFC has a lot of space in which their very large amount of pilots can rat. One of the most popular regions for CFC pilots to rat is Deklein (but it isn't the only place CFC pilots rat, and it isn't the only place GSF pilots rat).
" Maybe HERO cannot rat, due to everyone thinks they are easy preys. But that doesn't change the fact that they can't really use more Sov." You are assuming that HERO's purpose for claiming space is to rat more. What if their goal is to create a rentable region so they too could make renting income? And instead of renting providence, they could claim it as their home and rent catch. It could also be that the war is to give their members content and a goal to work towards. A goal such as make x isk per week to fund wardecs, mine x minerals to make a corp orca, or conquest a region can all motivate people to keep logging in and playing, especially if they are all burnt out on killing red crosses. Half of BNI member base is not inactive because they are spies, alts or already driven out of the game. Then you have the problem that the ANI /Moa/Thorax doctrines led to a gunnery skills which are somewhat supoptimal for ratting because of Sansha tracking disrupting. And in the early weeks after capturing Sov everyone was roaming through it. [Ratting] is the only effective way to actually *create* ISK. Station trading and stuff might earn an individual more, but that's just moving already existing ISK around. If ratting stops the EVE economy collapses. This is false in two ways. First a quibble: ISK are created from two main faucets: ratting, and wspace blue loot. (Of course, blue loot is one step removed ratting, but unlike rat kills, blue loot must be collected and taken to NPCs to sell.) As such, even if for some reason it was necessary to pour ISK into the EVE economy, it could be done without rat bounties. Indeed, if a faucet other than either of these sources was needed, CCP could invent it. They could go all Helicopter Ben on us, for example. Give each subbed account 100m ISK per month. But that's just a quibble. The main way your statement is incorrect is that the EVE economy is not dependent on ratting. The null economy is, and to a substantial degree, the wspace economy. But these are not EVE; just part of it. In fact, as I have pointed out before, the function of ratting within EVE is a massive tax on highsec to benefit null and wspace. We should not fool ourselves on this point. Nullsec is worth subsidizing, or at least it has been, because that is where priceless publicity for the game is being generated. And it is to be hoped that null can eventually stand on its own feet economically. But it is not currently the case. Last year I did a thought experiment on what it would take to make ISK into a hard currency, that is, a money which is neither being created nor destroyed.